Michael Imperioli (James Michael Imperioli) is an Italian-American actor, writer, director and producer that was born on March 26, 1966 in Mount Vernon, New York, USA. He is 5' 8" (1.73 m), and his parents are mother, actress Claire Imperioli and father, Dan Imperioli, who was a bus driver. He went to Lincoln School in Mount Vernon and Sacred Heart High School in Yonkers, New York where he graduated in 1993. He is mostly known for his role as Christopher Moltisanti on The Sopranos (1999), Law & Order (1990) as Detective Nick Falco, Life on Mars from 2008-2009 as Detective Ray Carling and Detroit 1-8-7 as Detective Louis Fitch. He directed and wrote his first film The Hungry Ghosts (2008) which was chosen for the 2009 Rotterdam International Film Festival in the Opening Night Selection. 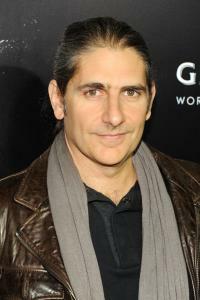 He was nominated for two Golden Globe Awards and five Emmy Awards for his role as Christopher Moltisanti on The Sopranos. He won a Primetime Emmy Award in 2004 for Outstanding Supporting Actor in a Drama Series The Sopranos. He has written and acted in a lot of episodes for The Sopranos. He was engaged to actress and writer Lili Taylor. He married Victoria Chlebowski in 1995, and they live in the Tribeca neighborhood of New York City. They are students of Tibetan Buddhist Lama Garchen Rinpoche. He has three children, and his son Vadim acted in Detroit 1-8-7 with him. He has two children with Victoria, Vadim (1997), and David ( 2001) and a stepdaughter, Isabella. - He served on the board of the Greenwich International Film Festival. - He won the "Tournament of Stars" competition on the cooking show Chopped and send his winnings of $50,000 to the Pureland Project charity which builds and maintains schools in Tibet. - He co-hosted The Jazz Foundation of America 20th Anniversary annual benefits concert, "A Great Night in Harlem", at the Apollo Theater in May 2009.